Magelang has certainly become an interesting destination city to do various holiday activities, including when touring the city with family during the holiday season or weekend. Magelang not only has tourist attraction like Borobudur Temple. There are several other interesting tourist destinations that you can find around the largest temple. 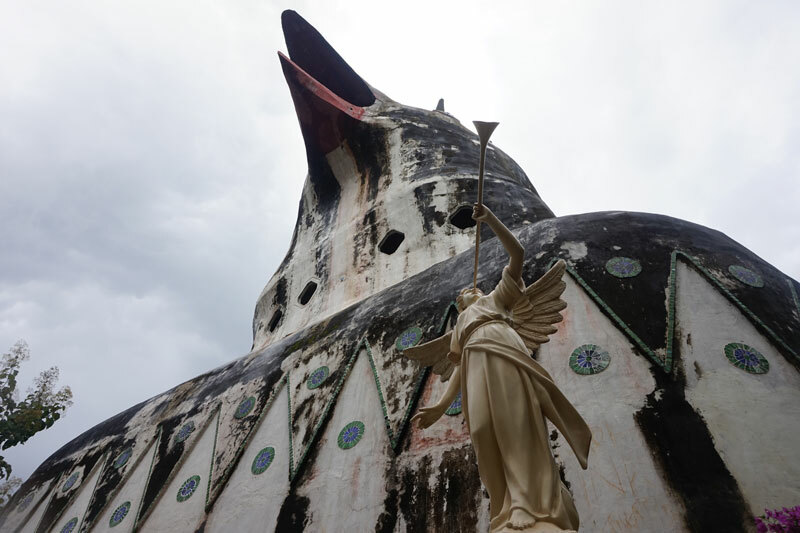 One of them is Bukit Rhema or known as Chicken Church. Bukit Rhema is a religious tourist attraction in Magelang which the construction has only reached 70%. Although its construction is not yet completed, Bukit Rhema has been visited by many domestic and foreign tourists. Bukit Rhema is also known as the best spot to see sunrise and private sunrise. Bukit Rhema stands on the hills of Menoreh, Bukit Rhema also surrounded by several mountains; among them are Mount Sumbing, Merbabu, Suroloyo, Merapi, so we can see the exotic sunrise panorama from this place. What can we do in Bukit Rhema ? Bukit Rhema provides some quite private prayer rooms for anyone who wants to pray. The place of the prayer rooms is located in the basement of the Dove-Shaped Building. The rooms are special to pray because Bukit Rhema as the Chicken Curch is not only known as a Church but also the house of prayer for all nations. With gentle breeze while sipping the traditional warm wedang (Indonesian form of beverage) as well as the coffee sold in this shop will make you feel like living at home where many people call this ‘Chicken Church’, especially for those who come to this place, every entrance ticket of Bukit Rhema that you buy has included free cassava traditional food which is named Latela Gombong Cassava. Latela Gombong Cassava is processed by local residents and served with traditional chili that makes the taste of cassava more delicious. Have you ever eaten cassava with chili sauce? Let’s try it at the Kedai Rakyat W’Dank Bukit Rhema. Cassava flavor is not the same as fried cassava that you usually eat. Bukit Rhema in addition to having unique building architecture, the scenery in this place is very beautiful, since the location of Bukit Rhema is on top of a hill. Can you imagine how the early development of this project? Almost every corner of Bukit Rhema becomes traveler’s favorite place for taking selfie and wefie due to its beautiful scenery. So.. for you who are still confused where to go, do not hesitate to come to Bukit Rhema as known Chicken Church. For all of you who still confused wherethe location, you can find it easily. Open the navigation app or Google Maps and type on search bar ‘Bukit Rhema Chicken Church’. You will not also be lost because almost each intersection to Bukit Rhema is completed with signage. We wait for your coming .. Your arrival is very helpful for us in completing this Bukit Rhema development project.